Humanities professors from the University of Virginia describe their frustrating attempts to give away their innovative textual study tool via Apple’s App Store. The reason the App Review Team gave (again and again) was that our app was “simply” or “just a book” (their words), and that it therefore had to be formatted in Apple’s iBooks Author program in order to be distributed through the iBookstore. We decided to play along and make a good-faith effort to convert our app into an iBook, only it doesn’t work. We cannot reproduce all of the features of our app–including some of the ones that we think the app needs to be useful to anyone–and for reasons no one has been able to explain, the iBooks Author file seems to expand well beyond the maximum size for an iBook (currently 2 GB). We’re stuck with an app that does just about everything we envisioned, that has impressed the many people to whom we have shown it on our own iPads, that does something that no app or printed book out there does–but that Apple won’t allow to be listed in its App Store. 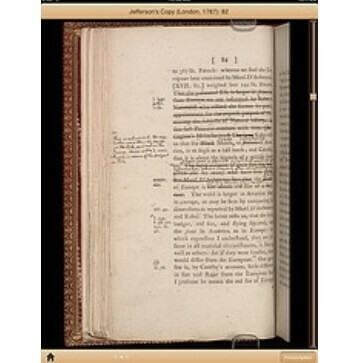 So, yes, it is possible to download an app called “Burp and Fart Piano” that does pretty much what you’d expect such an app to do, but a free, edited edition of Jefferson’s Notes on the State of Virginia that lets you compare Jefferson’s and Lafayette’s own copies and to zoom in on Jefferson’s handwritten corrections? No dice. —ProfHacker – The Chronicle of Higher Education. 10 Sep 2013 in Academia, Books, Business, Culture, Cyberculture, Design, Essays, Media, Technology, Weirdness.